Below is our letter written to The Times in response to today's article on the newly published study into the effects of heather burning on the ecohydrology of river basins. 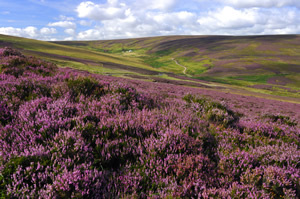 Ben Webster’s report (Burning of grouse moors linked to global warming, report 1st Oct) highlights the results of a new study indicating that heather burning could contribute to climate change. Although this measure is largely carried out to benefit red grouse, who eat the young shoots of heather, we must not forget that it has a positive benefit for many other species too. Mountain hares feed on the fresh heather; it provides cover for ground nesting birds and a mosaic of edges and patches across the moor provide vital habitats for many other different species too. Crucially, heather burning is also a significant management tool to mitigate against the risk of wildfires, which can easily gain a hold and destroy everything that moor owners seek to protect. With growing evidence that the earth has lost half of its wildlife in the past 40 years, it is imperative that we support practices that enhance environments for wildlife. Carefully managed rotational heather burning is known to enrich the land for some species in fragile upland areas. What has not been investigated is the impact on these species if burning stopped. Is this really GWCT's response to this scientific study? You've lost the plot! How many mountain hares are killed in Scotland by grouse moor mangers and what percentage of wildfires are as result of controlled burns? If you were to burn to prevent wildfire alone, I suspect it would be an awful lot less than what is done for grouse management (or even cut instead where possible) - the wildfire one is a bit of a red herring Im afraid. Please don't use such tedious claims to justify continuation of environmentally damaging practices, I expect more from an organisation that prides its self on its science. It may benefit some species, but it is bad for a whole host of others, many of which are detailed in the report. More grouse and curlews is imply not enough to warrant the killing of everything else. If management for grouse is so great for mountain hares, how do they justify some grouse managers for culling mountain hare due to it being a vector for louping ill? What percentage of wild fires are a result of controlled burns? How much burning would grouse moor managers have to do to genuinely control wild fire risk (or cut instead!) vs what is done for commercial grouse management - I would suggest it's an awful lot less. What proportion of wildfires occur in close proximity to major public rights of way/access points in relation to the vast open areas of grouse moors that the public rarely venture on to? Would wetter, less burned and more naturally maintained bogs not provide lower fire risk than commercially managed moors that are burned regularly to promote fire tollerant heather growth? Maybe times are a changing, and for the better. I'm sure you'll agree.